Sometimes my kitchen inspiration comes from the internet, and sometimes it comes from a restaurant I have to copy. But occasionally, I have to try to make something that someone made for me. That’s the case with today’s recipe! Last month Mr. P and I visited family in Chicago, and for breakfast, we had a delicious coffee cake that his sister made. It was then that I realized: I’ve never made a coffee cake. At all! Let alone a delicious cinnamon one, like that one! So when my family came to visit a couple of weeks ago, I knew exactly what I had to make for breakfast. You could say that I was just passing on the generosity of others... but really, I just wanted more coffee cake. I should’ve asked my sister-in-law for her recipe, but the time came to go to the grocery and I still hadn’t asked her. So instead I poked around the internet for a minute and came up with this recipe from Martha Stewart. That’s a gold seal of approval if there ever was one, right? So let’s get to it! 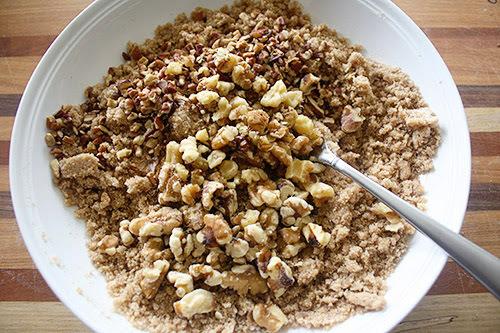 First things first: mix up the streusel. 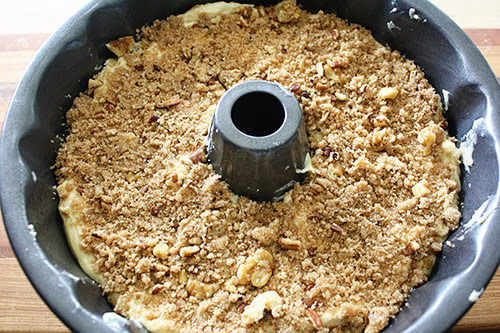 The major complaint with this recipe in the comments (always read the comments) was that, as written, this recipe made way too much streusel filling. 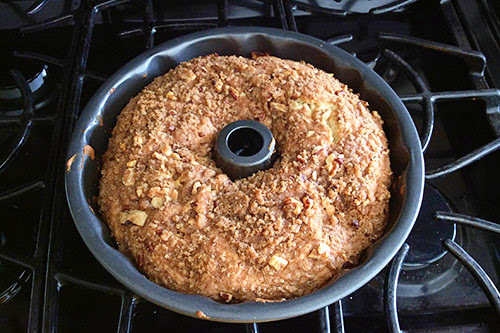 So I cut in half, using 3/4 cup brown sugar and 1/2 stick of softened butter, then mixing in 1/2 T ground cinnamon, a sprinkling of cloves, 1/4 cup sugar, 1/4 cup flour, and 3/4 cup nuts – a mixture of pecans and walnuts. I think that made just about the right amount! Then time for cake batter. Don’t halve this part! 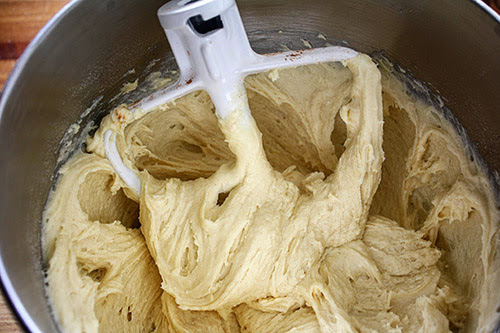 I started by creaming together the butter (10 tablespoons – that’s a stick plus two more tablespoons) and a cup of sugar. 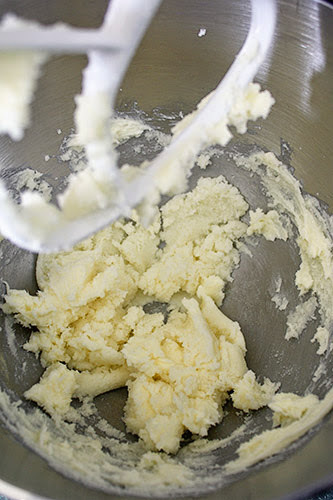 I let the mixer beat them together for a good while, until they were creamy and fluffy. Then I mixed in a teaspoon of vanilla, three eggs, and a teaspoon each of baking soda and baking powder. Finally, I added a cup of flour, then 1 1/4 cups sour cream, then another 1 1/2 cups of flour, mixing well after each step. At the last minute, I sprinkled in just a bit of cinnamon too, just because I really wanted a cinnamon coffee cake! The resulting batter is SUPER thick. It made me wonder if I’d over-mixed the batter, but I think it’s just meant to be a super dense cake, and that needs a super thick batter! 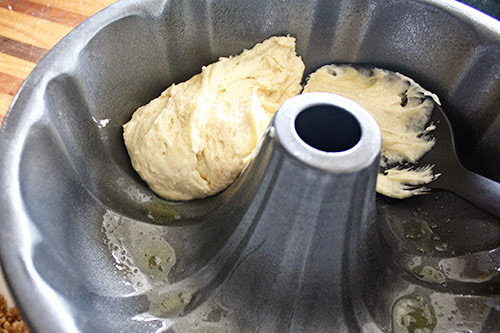 Its thickness makes it a little challenging to spoon into the greased bundt pan. But you can do it! Add half to the pan, and spread it around. Then start spooning in the streusel filling – half to two-thirds of it. 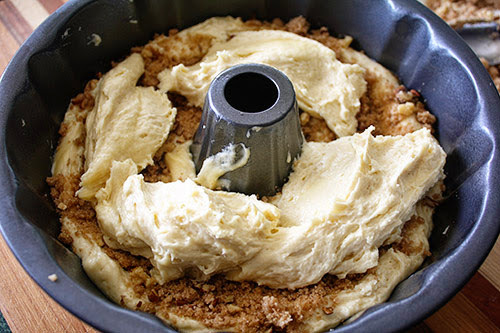 At first you’re going to think there is no way this is all gonna fit in there, but it helps to constantly press the streusel down through the middle of the batter. That makes the edges of the batter come up, which will end up sealing the streusel inside the batter! And finally, cover the top (which will become the bottom) with the remainder of the streusel. Now, I only added half the streusel to the middle, because I was convinced that too much streusel would cause the cake to fall apart upon inverting out of the pan. 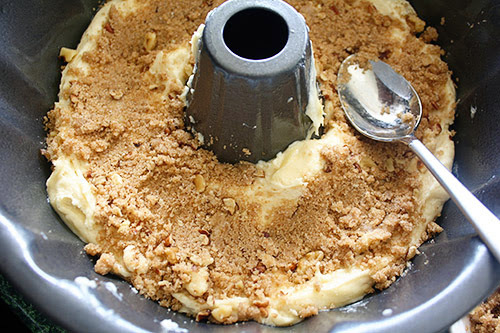 But if I were to make this again, I’d put 2/3 of the batter in the pan, then at least 2/3 of the streusel mixture, pressing it in deeply as above. That way there’d be more streusel in the middle, which is where it’s nice and tasty with the cake! Once you’re done assembling, pop it in a 350-degree preheated oven and wait an hour! I actually had to leave for work (yup, making this on a weekday morning) so Mr. P snapped the result coming out of the oven an hour later. with success! He texted me that photo to show me just how perfectly it turned out. All my worrying about too much streusel and poor cake structural integrity was for naught. The next day, right before my family was ready for breakfast, I half-followed this other Martha recipe to glaze it. 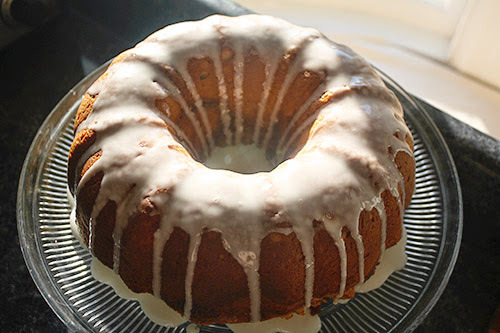 Literally half-followed – I used a half-cup of powdered sugar with just enough milk stirred in to make it drizzle-able (only a few tablespoons). And how was it? 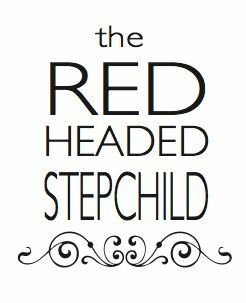 Mr. P thought it was a bit too cinnamon-y for his taste – and as I hadn’t tried it when he said that, I panicked a bit! Fortunately, it was just the right amount of cinnamon, sweetness, and savory (with the butter and the nuts). 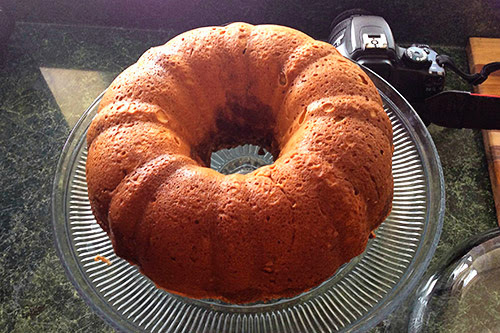 It really couldn’t have turned out any better, except for maybe to relocate more streusel inside the cake. So if you’re stressing over the thick batter or ridiculous amount of streusel, no worries! It’ll all come together in the end. And your guests will love it... and you... and then will have to go home and make a cinnamon coffee cake of their own. I am happy to say I can vouch for its deliciousness! My gosh, that looks delicious! I'm not a great baker but I think I'll have to give this one a try.